Bangkok, the capital and largest city in the Kingdom of Thailand. Mentioning the name almost always conjures up images of it’s renowned nightlife, temples, markets, food, and the hectic ways of riding in a tuk tuk through the crowded city. For the most part, those thoughts are pretty much spot on. 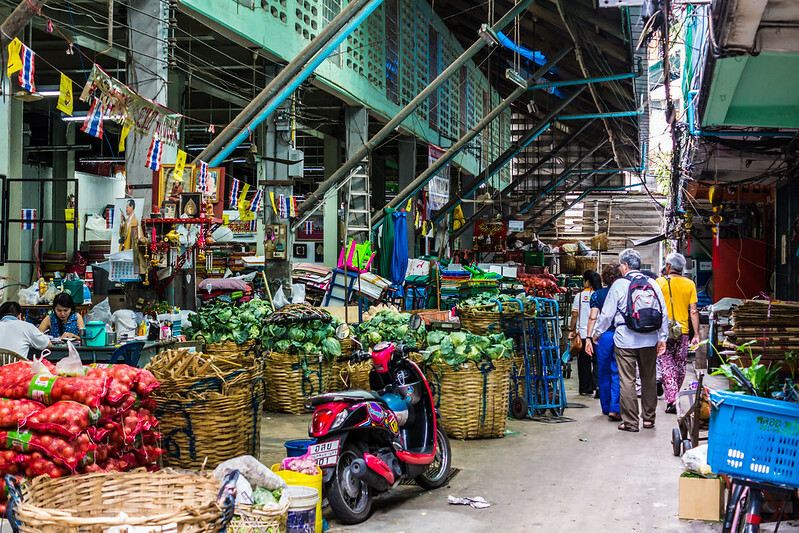 There are more temples than one could ever visit in a day (or two or three), the markets and the foods you can find in them are exciting, the nightlife is pretty much one giant party, and tuk tuks can be a bit of an adventure (we’ll get into that later). So why Bangkok? Well, my experience in Asia had so far precluded any part of Southeast Asia, having only been to Japan, Hong Kong and Macau. Southeast Asia has that bit of mystique to it and with Thailand being a relatively safe destination, I figured that it would be a good introduction. Of course, the desire to go anywhere on this trip was based around the availability of flights; thankfully Kenya Airways has a flight between Nairobi and Guangzhou that stops in Bangkok. There was one downside with how my itinerary turned out; with the first two weeks of my three week trip split between South Africa, Dubai, and the Seychelles, my time in Bangkok and Tokyo would be very short. I had contemplated spending three nights in Bangkok and just one in Tokyo, as I had been to Tokyo before, but decided as much as I would prefer to have more time in a new destination, it wouldn’t make any sense to essentially not spend any time in Japan either. The best use of my limited time, I felt, was to split my time evenly between the two cities. While it would be less-than-ideal, it still would afford me enough time to sample the city and get a taste of what Thailand has to offer. 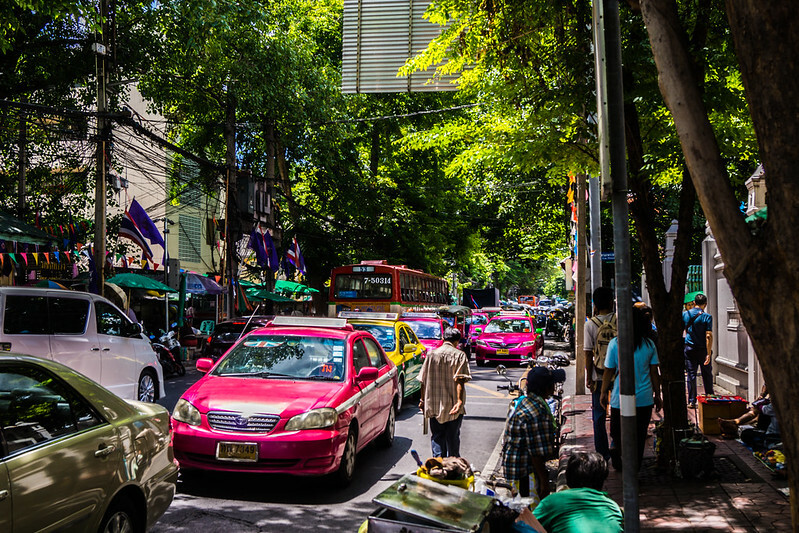 Bangkok is definitely a city that could easily overwhelm your senses, if you jump right into it. I tend however to not jump right into things when in a new place, especially right after getting off of a long international flight; I much prefer to take it easy at least that first day and night. What better of a way to take it easy and get the lay of the land than to reconnect with an old friend? Ben was one of the first friends that I made when my family moved to Florida at the start of sixth grade. We went to the same schools, both of us were in scouts (we actually got our Eagle Scout awards the same night – yeah, I’m that nerd), and even went to Italy with a other friends as part of a Latin Class trip in high school. However, as it tends to go with those older friendships, you get to the point where you don’t see each other much and you don’t talk quite as much. The last time I had the chance to hangout with Ben was in early 2014 when I had decided to make an impromptu trip to Portland where he was living with another one of our friends at the time. Now I knew that he had gone overseas to teach English, but I didn’t know all of the details. Thankfully, he had seen on Facebook a few days before I was set to land in Bangkok that I was heading there myself, which is where he happened to be. 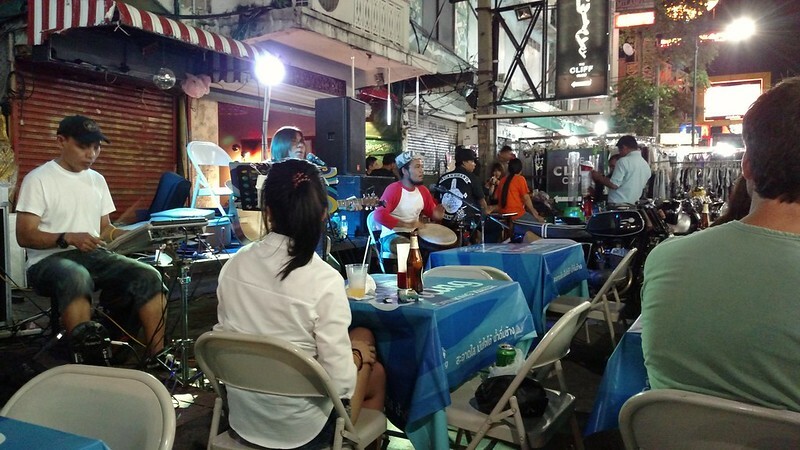 We put together loose plans for my first night in Bangkok, a weekday night, since I was not going be there for the weekend. That was probably a good thing, just to keep it from getting too crazy! My friend didn’t live in heart of Bangkok, so I summoned a taxi from the hotel to drop me off in the neighborhood that he lived in next to a large convention center North of Bangkok. He had tried to convince me to take a cheap minibus, but as confident as I am in traveling in, I was not quite feeling that adventurous. Cheap Thai beer started off the night and capped off the night at the late hour of 1AM. In the middle there was an enjoyable cheap meal at the outdoor Muangthong Thani Food Center, which is a collection of food stalls behind the convention center. 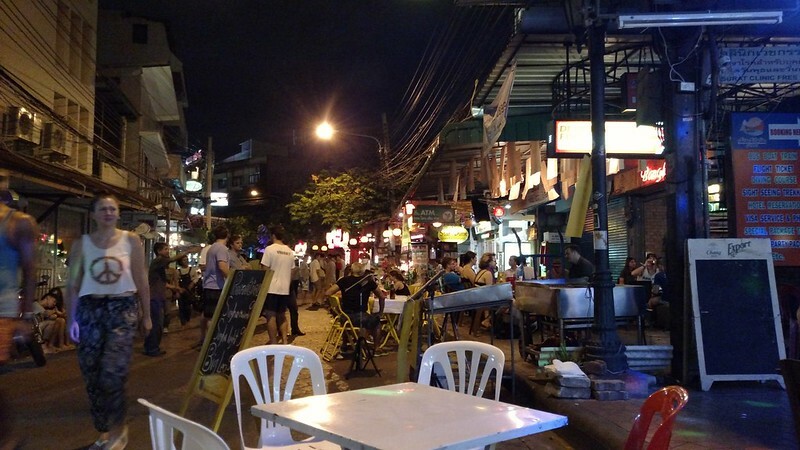 With the area being a somewhat residential area, there wasn’t any crazy shenanigans, unless you count sitting outside a bar on wooden crates drinking more cheap beer. It was good to catch up with him and in all of the most unexpected places in the world! The morning of my one and only full day in Bangkok thankfully was one without a hangover. It was a good thing my friend had to work the next day! With being up at a reasonable time, it meant hitting the sights would be an easy task. My first task was to head down to the Chao Phraya River to catch the the boat up the river to start my sightseeing. 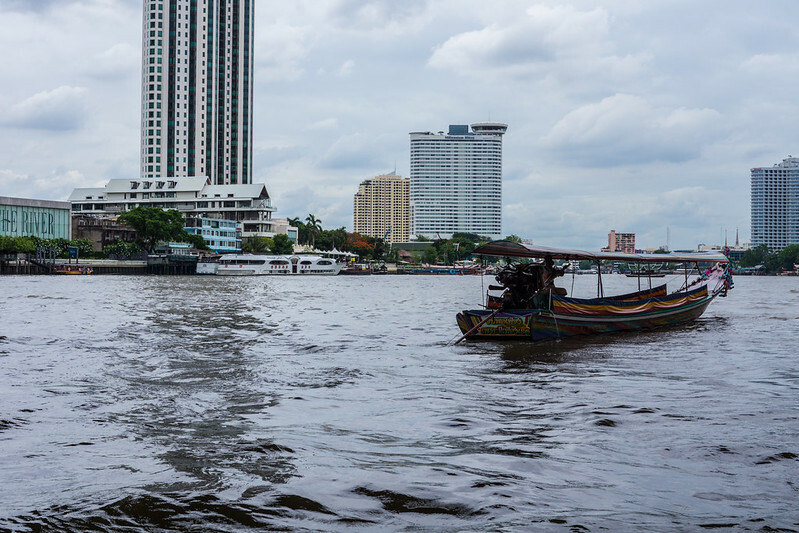 Cruising up and down the river is one of those essential Bangkok experiences; although one must be careful. There is a popular scam that involves the offer of a personal tour on a longtail boat that could have you stranded several meters away from the pier on your return with the dilemma of paying an amount of cash or making a swim for it. Sticking the ‘Tourist Boat’ or other public water taxi services that go up and down stopping at piers along the way is most definitely the way to do it. Plus the fares are cheap! I didn’t go very far on my first trip up the river. 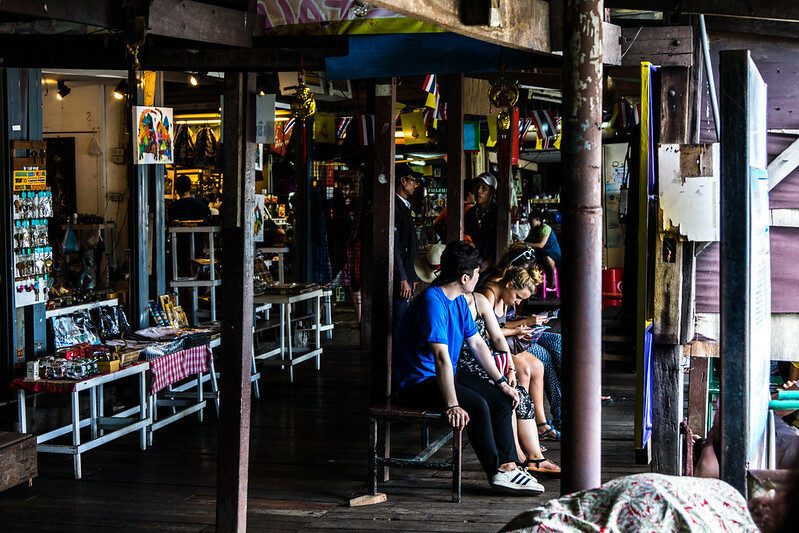 From Sathorn Pier, I disembarked at Pak Khlong Market with the intention that I would walk around the market for a bit and then walk the streets of Bangkok to the nearby Grand Palace and Wat Pho. 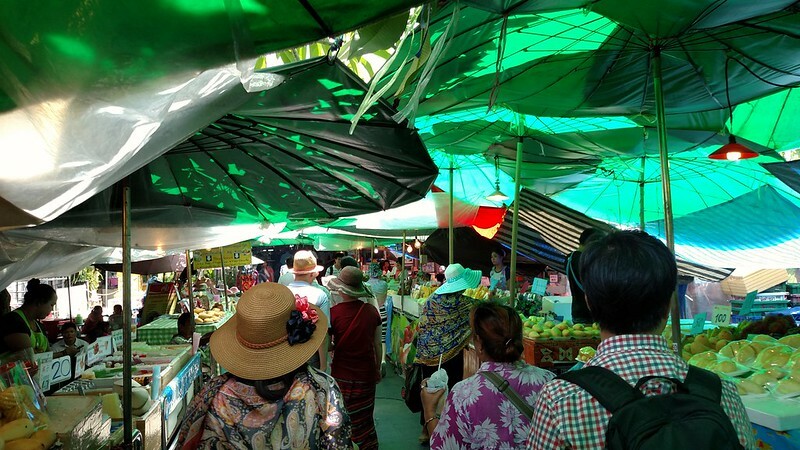 I spent my time meandering and taking in the sights and smells, but I did not buy anything or even eat anything. From there, things got interesting. I was walking down the road and I fell for a scam. Yes, you heard me right. 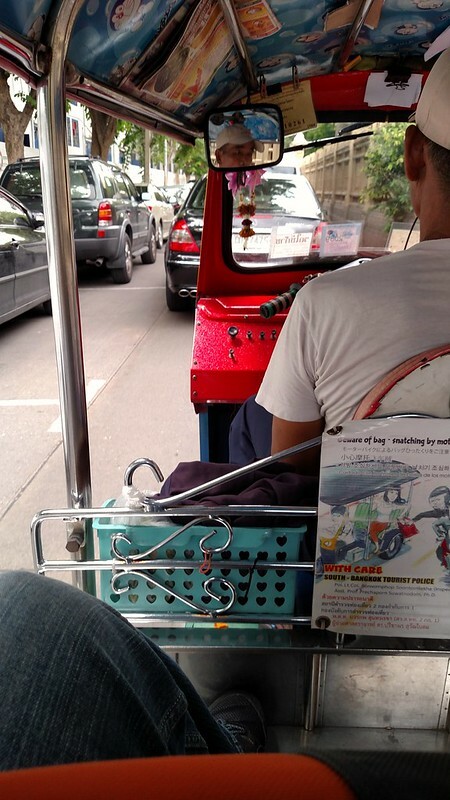 With all my travel experience and ability to recognize a scam, I somehow fell prey to one of the most famous and common in Bangkok: the Tuk Tuk Scam. It takes a lot for one to usually admit that they fall for something like this (if they even recognize that they fell for the scam in the first place), but I owned up to it pretty quickly to my friends and family. Why? Well, if I don’t share it then more and more will continue to fall for these scams! In short, while walking along the road I was approached by a friendly person who claimed to be a teacher and that the temple (Wat Pho) was closed until later in the day, claiming that something that the Monks would be doing something until then. As a tourist who is less than familiar with the religion and customs you think “Well, that certainly sounds plausible”. From there, they’ve got you. He pulls out a map and starts putting together an alternative sightseeing list and then without missing a beat walks over to a Tuk Tuk driver and “negotiates” a price to take me around for a ridiculously low amount – I think 20 Baht, if I recall correctly. That alone should be a red flag! Even a beer will still set you back 100 Baht, so 20 Baht is beyond low for an afternoon of being driven around! Strangely enough, I agreed, jumped in and of we went. It took about a minute for it to sink in what had happened. I wasn’t sure what the best course of action was, so I decided to stick with it. At the first temple (some random one that tourists wouldn’t go to), I saw other tourists being dropped off here as well, and it seemed innoculous, so I went in and walked around. And you know what happened? A friendly person approached me! He started going off on how I should go check out the Thai Suit Factory, which miracously was only open to foreigners today! Oh my goodness, how could I be so lucky! Guess where I was going to wind up next? I should have bailed through a back exit then, but I hopped back in and found myself at this ‘suit factory’. The place was crowded, not for it’s quality I’m sure, but based off all the tourists they prey on. I wound up buying a couple of ties as I figured if I bought something it’s at least better than nothing. From there it was off to another temple (with another friendly person extolling the virtues of buying gems) and then to the next opportunity to rip you off at…can you guess it? A gem shop! I was at this point pretty fed up and was seriously calling the Bangkok Tourist Police; instead I decided to make the Tuk Tuk driver an offer he couldn’t refuse to end this charade: money. I decided handing over 1000 Baht was the easiest solution and to be honest had he not taken the cash, I was going to be jumping out of the back. I was done and I was ready to get on with my day. So while this ended my perfect track record of not falling for travel scams, I share it so that others can hopefully recognize these types of scams and not wind up in the same boat as myself. And as far as if I am embarrassed about falling for it? We’re all human and we make mistakes from time to time; if I was embarrassed I wouldn’t have said anything! Eventually, I made it to Wat Pho, my original destination earlier in the day before I found myself far away. 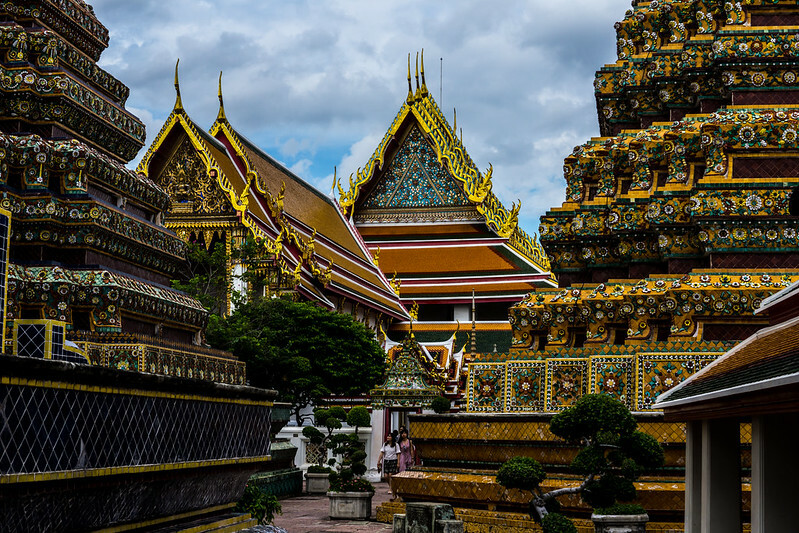 The Temple complex itself is fairly large and located right next to another tourist site, the Grand Palace. 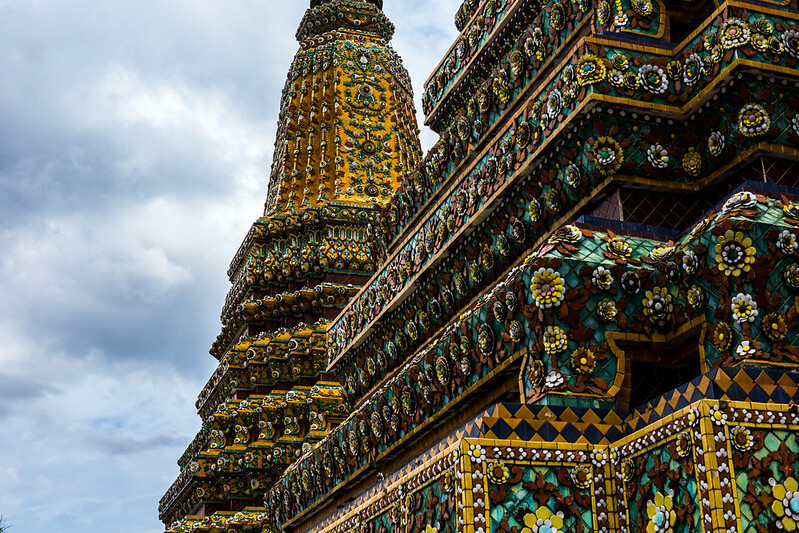 There’s a small entry fee to enter the Wat Pho complex, but it is most definitely worth it! 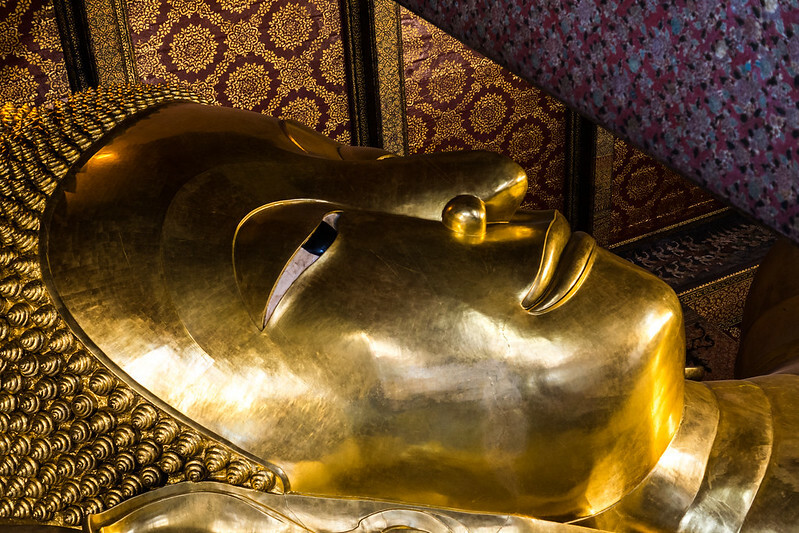 The most popular stop within the temple is the giant golden reclining Buddha that became extremely crowded with all the other tourists. Outside of this building however you can and will find spots throughout the complex where there are far fewer people milling about. The important thing is that there are a wide variety of things to check out, whether it be the architecture of the buildings themselves, to statues and other forms of art. As the birthplace of Thai Massage, it is also possible to get a massage at the massage school located on the temple grounds. Being that it is extremely popular, I had to wait for about 30 minutes before my massage. Now, unlike what everyone is probably thinking, the massages are done clothed and in a very crowded room. It’s not going to be a spiritual or relaxful massage, but it was definitely a relief for some sore muscles for 30 minutes from having walked all over Bangkok. 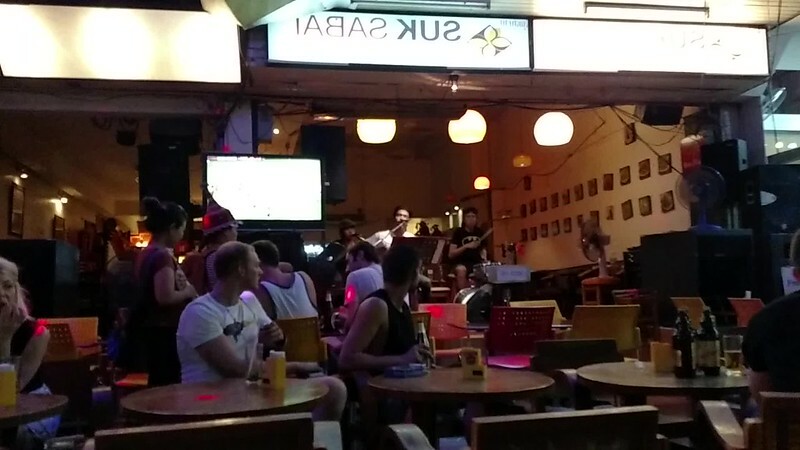 Having spent my first night in Bangkok with my friend, I decided for my second and last night to explore some of the popular tourist nightlife areas. I felt like it would be essential as part of my Bangkok experience. So after kicking off my evening at WOOBAR at the W Bangkok, I hopped in a cab bound for Khao San Road: the center of the party in Bangkok. There’s bars everywhere; in the buildings lining the streets, on the street, and on the side streets and alleys that snake out from the main road. The good thing is that the street is closed off, and nearly everyone is here, or at least it seems. It didn’t take me long to feel like I was at home (and that’s not counting the guy in a Panama City Beach t-shirt I saw earlier in the day), with hearing a band playing ‘Sweet Home Alabama’. I stopped at this outdoor and in-the-street establishment and enjoy a cheap beer while taking in the music on this relatively hot night. But after my one drink, there was more exploring to do! 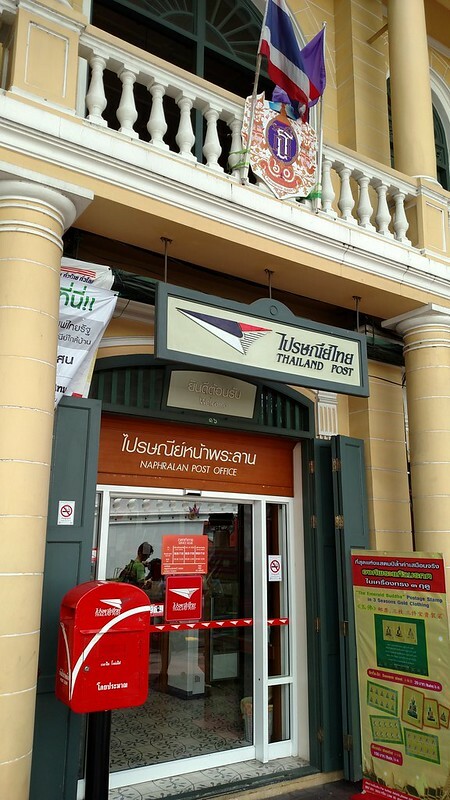 Stop #1 – Sweet Home….Bangkok? There really seems to be something that caters to every whim. 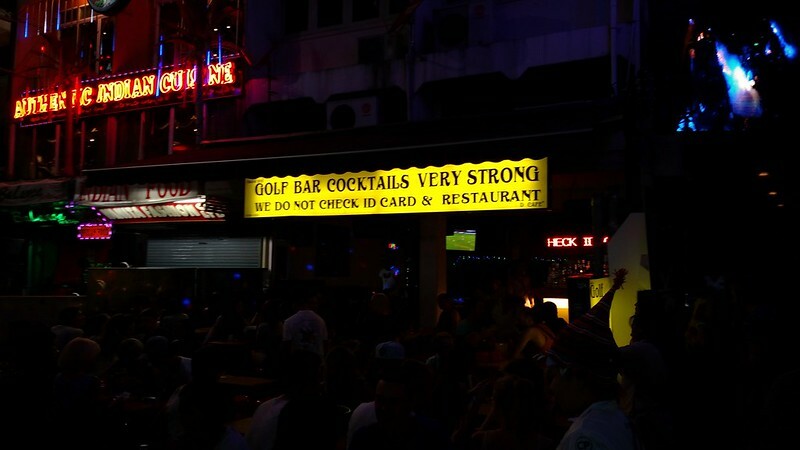 There’s even the bar with the sign that states that they don’t check ID and make strong cocktails. Only in Bangkok! There’s plenty of places where tourists can make the mistake of drinking too much, but once you get off the main drag you can find some nice little gems that are more laid back. Only In Bangkok, Would This Be A Sign! I’ll be honest, I spent probably the most of my time just walking up and down the street taking it all in. Eventually, I did settle on the second and final establishment of the night on one of the side streets. This bar was one of a few next to each other that had live music, wasn’t crowded, and sidewalk seating. I settled down while I listened to the cover band play a song list that was the best of 90s Alt Rock before I would wander my way back to the hotel. It was a relatively early night, but that was by design. I was flying on towards Tokyo the next day, so I didn’t want to lose my last few hours in Bangkok nursing a hangover. Although I was flying out that evening, I was able to get up early enough to be able to tackle some last minute sightseeing in Bangkok. Especially after the detour that the Tuk Tuk caused for me the day prior, this would be my last chance to see a few more things. 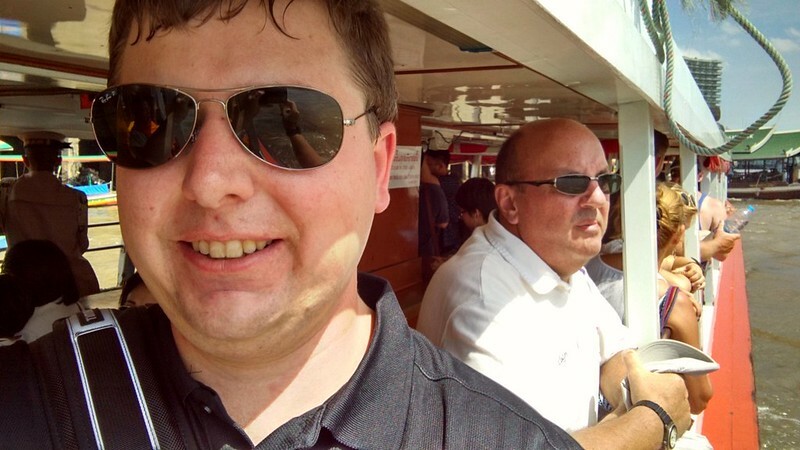 Once again, I headed up the river on the boat, with the intentions of going to the Grand Palace. However, between the dress code and baggage policy on top of the entrance fee, I just didn’t feel up for it, so instead I set out to wander. My first stop? The Post Office across the street so that I could mail myself a post card, continuing the tradition I started on my first international trip. They make some of the best and cheapest souvenirs! Mailing Things Is Exciting, Right? From there, I found myself wandering the streets in the immediate vicinity, taking it the sights, sounds and smells. As I would get near any of the river piers where there seemed to always be a small market out front, which all seemed to have quite the assortments of interesting foods for sale. I think just wandering around without any set agenda of things to see or do was the best way for me to end my very short time in Bangkok. It left me not feeling like I had rushed myself by resigning to the fact that I just wasn’t going to see it all. As a result, I could focus on just relaxing and enjoying my vacation. Even though I tell people all the time that I take it easy with my trips, historically I have tried to cram so much in over a short period of time. I mean, the first time I traveled outside of the US on my own, I had visited five countries in the span of a week. When you only have two nights in a destination, sometimes you have to remind yourself that it is ok to not see or do it all. I think it has become easier over the years for me to accept this as the years have gone on, I’ve continued to travel all over the world. There was a point where I used to always think “this is a once-in-a-lifetime trip” as I set out to visit somewhere new. And while there are some destinations I may never make it back to in the course of my life, there are many that I have and will. I can say with certainty that Bangkok is a city that I will be back to in the future. It deserves a proper visit, and there is of course so much more to do and see within Thailand outside of Bangkok that would be worthwhile as well. 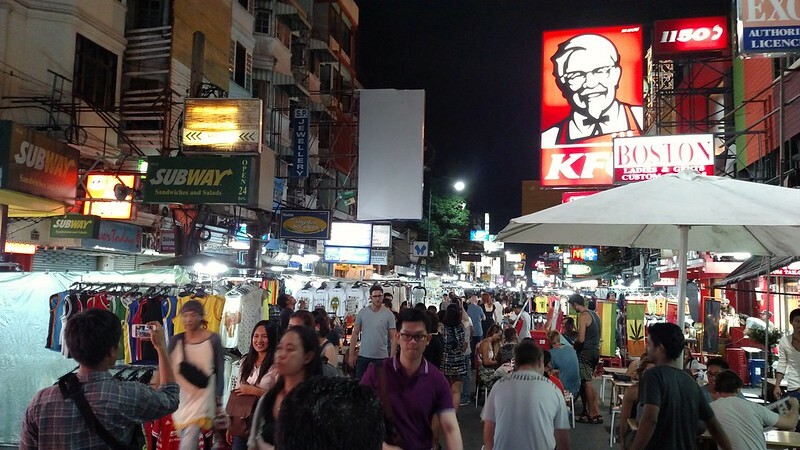 Did I find Bangkok to be a generally welcoming city? Of course! And really, the whole Tuk Tuk experience is solely my own fault for letting my guard down, and I can’t hold that as some reason to not want to come back. Travel isn’t necessarily about everything going perfect all the time; too many get hung up on the “perfect trip”. From my perspective, my time in Bangkok, even with that experience, was almost perfect. I think there’s a lot more in general that I want to see in Southeast Asia with everything it has to offer. My only hope is that I am back sooner rather than later to dive a bit deeper. Who knows, maybe there’s a moped trip in my future. There’s many more pictures from my short time in Bangkok, here on Flickr. This entry was posted in Asia, RTW, Thailand, Travel, Trip Report. Bookmark the permalink. Follow any comments here with the RSS feed for this post. Post a comment or leave a trackback: Trackback URL.